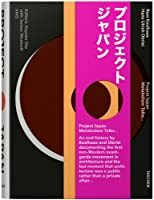 I ordered one more book, Project Japan, from amazon.co.jp and I received it today. I have been deeply concerned with Metabolism, a Japanese architectural movement in 60's, especially for last months. There has been kind of raising of interests in Metabolism as you can see at a large-scale exhibition which has been held at Mori Art Museum, a book on Metabolism, Metabolism Nexus, written by Hajime Yatsuka released in this year, and, of course, this book.